On December 21, 1979, the National Aeronautics and Space Administration (NASA) AD-1 Oblique Wing Research Aircraft (OWRA) took off from the main runway at Edwards Air Force Base (AFB), CA, for a 45-minute checkout flight. It marked the world’s first flight of a piloted oblique-wing airplane. This historic flight, which was flown with the airplane’s wing at its “straight” (0-degree angle) position, was soon followed by flights at wing angles of 15 degrees, 20 degrees, 45 degrees, and finally on April 24, 1981, at the 60-degree-angle design goal, thus proving the aerodynamic concept of an airplane with an oblique-wing configuration. 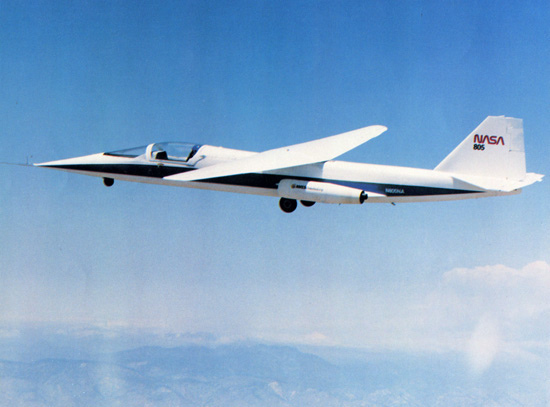 This initial oblique-wing program, which ran from 1976 through 1982, was a joint effort between NASA’s Ames Research Center and Dryden Flight Research Center, CA, thus giving rise to the aircraft’s name: Ames-Dryden AD-1 Oblique Wing Research Aircraft. Chapter 1 reviews the life of NASA aerodynamicist Robert T. Jones and his path to the oblique wing. Chapter 2 covers the extensive wind tunnel, model, computer-code, and simulation testing, first at Langley and later at Ames, as well as a number of NASA industry design contracts undertaken by Boeing and Lockheed. Chapter 3 reviews the design and fabrication of the AD-1 Oblique Wing Research Aircraft and its subsequent proposed use as a joined-wing demonstrator. Chapter 4 describes the flight testing and flight evaluation of the AD-1. Chapter 5 reviews the supersonic F-8 followup oblique-wing program. And, finally, chapter 6 reviews the subsequent oblique-wing plans and proposals. Appendices present the physical characteristics of the AD-1 aircraft, a detailed description of it, and a summary flight log of its flight research program. 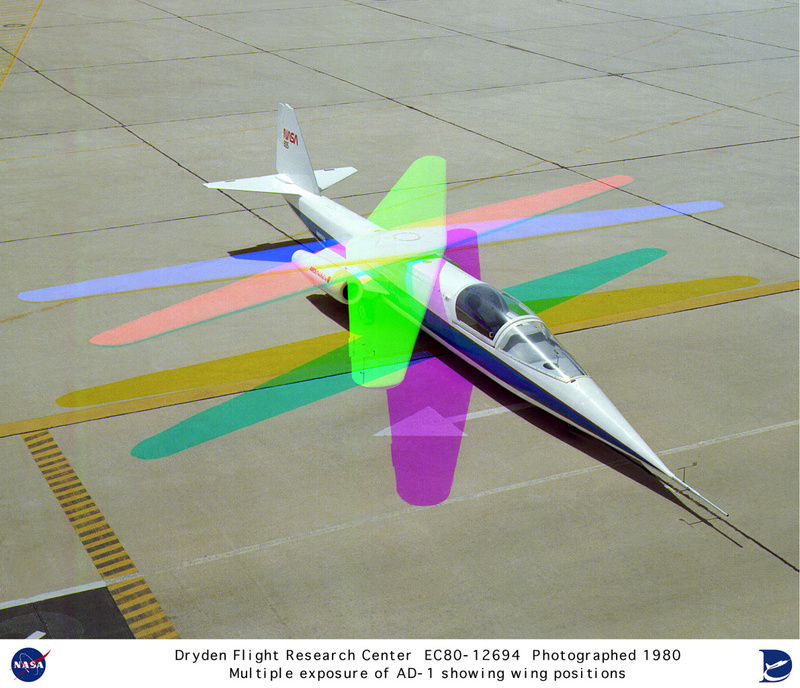 A program conducted between 1979 and 1982 at the NASA Dryden Flight Research Center, Edwards, CA, successfully demonstrated an aircraft wing that could be pivoted obliquely from zero to 60 degrees during flight. The unique wing was demonstrated on a small, subsonic jet-powered research aircraft called the Ames Dryden -1 (AD-1). 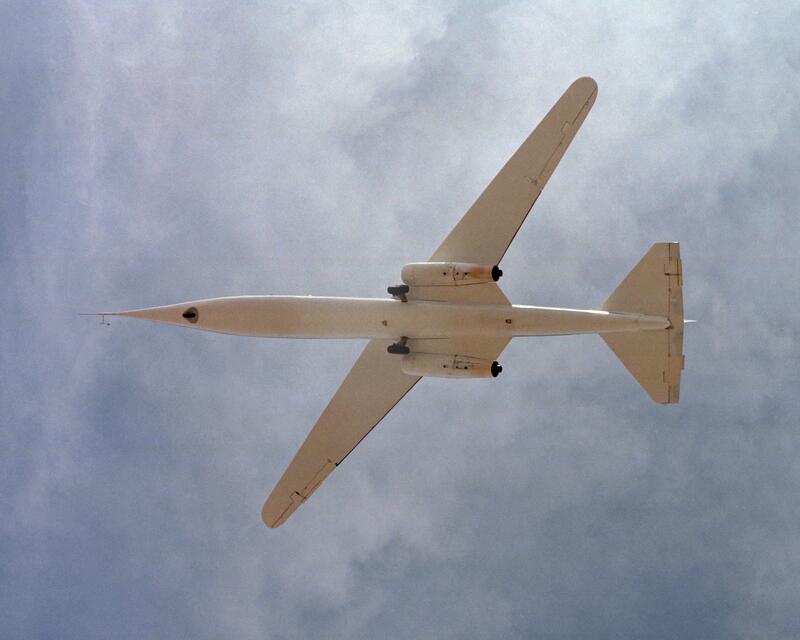 The aircraft was flown 79 times during the research program, which evaluated the basic pivot-wing concept and gathered information on handling qualities and aerodynamics at various speeds and degrees of pivot. The oblique wing concept originated with Robert T. Jones, an aeronautical engineer at NASA’s Ames Research Center, Moffett Field, CA. Analytical and wind tunnel studies Jones initiated at Ames indicated that a transport-size oblique-wing aircraft, flying at speeds up to Mach 1.4 (1.4 times the speed of sound), would have substantially better aerodynamic performance than aircraft with more conventional wings. At high speeds, both subsonic and supersonic, the wing would be pivoted at up to 60 degrees to the aircraft’s fuselage for better high-speed performance. The studies showed these angles would decrease aerodynamic drag, permitting increased speed and longer range with the same fuel expenditure. The AD-1 aircraft was delivered to Dryden in February 1979. 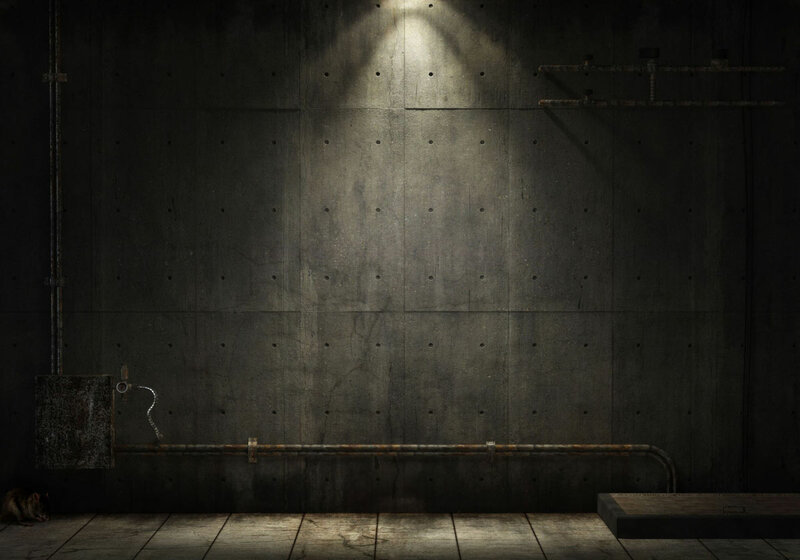 The Ames Industrial Co., Bohemia, NY, constructed it, under a $240,000 fixed-price contract. NASA specified the overall vehicle design using a geometric configuration studied by the Boeing Commercial Airplane Company, Seattle, WA. 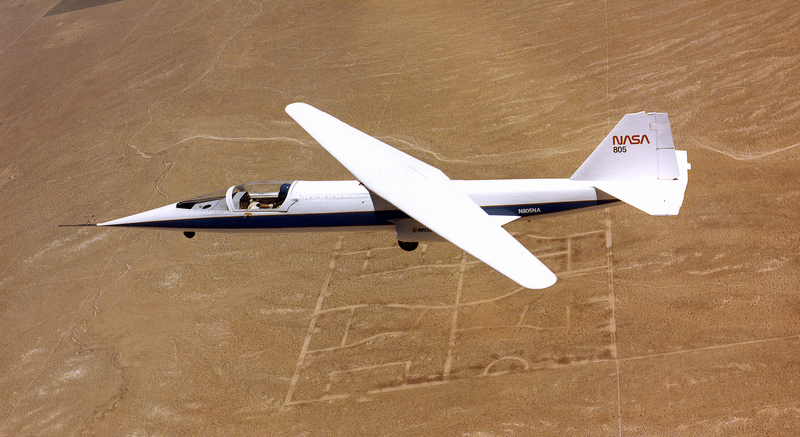 The Rutan Aircraft Factory, Mojave, CA, provided the detailed design and load analysis for the intentionally low-speed, low-cost airplane. The low speed and cost of course limited the complexity of the vehicle and the scope of its technical objectives. Piloting the aircraft on its first flight Dec. 21, 1979, was NASA research pilot Thomas C. McMurtry, who was also the pilot on the final flight Aug. 7, 1982. Powered by two small turbojet engines, each producing 220 pounds of static thrust at sea level, the aircraft was limited for reasons of safety to a speed of about 170 mph. The AD-1 was 38.8 feet in length and had a wingspan of 32.3 feet unswept. It was constructed of plastic reinforced with fiberglass, in a sandwich with the skin separated by a rigid foam core. It had a gross weight of 2,145 lb, and an empty weight of 1,450 lb. A fixed tricycle landing gear, mounted close to the fuselage to lessen aerodynamic drag, gave the aircraft a very “squatty” appearance on the ground. It was only 6.75 feet high. The wing was pivoted by an electrically driven gear mechanism located inside the fuselage, just forward of the engines. The research project to validate the oblique wing concept was typical of any NASA high-risk project  to advance through each test element and expand the operating envelope, methodically and carefully. The basic purpose of the AD-1 project was to investigate the low-speed characteristics of an oblique-wing configuration. The AD-1 made its first flight late in 1979. The wing was pivoted incrementally over the next 18 months until the full 60-degree angle was reached in mid-198l. The aircraft continued to be flown for another year, obtaining data at various speeds and wing-pivot angles until the final flight in August 1982. The final flight of the AD-1 did not occur at Dryden, however, but at the Experimental Aircraft Association’s (EAA) annual exhibition at Oshkosh, WI, where it was flown eight times to demonstrate its unique configuration. Following the flight research, Jones still considered the oblique wing as a viable lift concept for large transoceanic or transcontinental transports. This particular low-speed, low-cost research vehicle, however, as expected, exhibited aeroelastic and pitch-roll-coupling effects that contributed to poor handling qualities at sweep angles above 45 degrees. The fiberglass structure limited wing stiffness that would have improved the aircraft’s handling qualities, as an improved (and thus more expensive) control system would also have done. Thus, although the AD-1 structure allowed completion of the project’s technical objectives, there was still a need for a transonic oblique-wing research airplane to assess the effects of compressibility, evaluate a more representative structure, and analyze flight performance at transonic speeds (those on either side of the speed of sound). “AD-1 Construction Completed,” Dryden X-Press, Feb. 23, 1979, p. 2. Robert E. Curry and Alex G. Sim, “In-Flight Total Forces, Moments, and Static Aeroelastic Characteristics of an Oblique-Wing Research Airplane” (Edwards, CA: NASA TP-2224, 1984). Robert E. Curry and Alexander G. Sim, “The Unique Aerodynamic Characteristics of the AD-1 Oblique-Wing Research Airplane,” AIAA paper 82-1329 presented at the AIAA 9th Atmospheric Flight Mechanics Conference, Aug. 9-11, 1982, San Diego, CA. Thomas C. McMurtry, A. G. Sim, and W. H. Andrews, “AD-1 Oblique Wing Aircraft Program,” AIAA paper 81-2354 presented at the AIAA/SETP/SFTE/ASE/ITEA/IEEE 1st Flight Testing Conference, Nov. 11-13, 1981, Las Vegas, NV. Alex G. Sim and Robert E. Curry, “Flight Characteristics of the AD-1 Oblique-Wing Research Aircraft,” (Edwards, CA: NASA TP-2223, 1985). Alex G. Sim and Robert E. Curry, “Flight-Determined Aerodynamic Derivatives of the AD-1 Oblique-Wing Research Airplane” (Edwards, CA: NASA TP-2222, 1984).